Dietrich Peter "D. P." Esau: teacher and minister; born 13 February 1888 in Alexanderwohl, Molotschna Mennonite Settlement, South Russia, son of Peter Esau and Anna (Schroeder) Esau. He married Katharina Harder (3 February 1888, Halbstadt, Molotschna – 6 September 1962, New Westminster, British Columbia, Canada), daughter of Johann Harder and Anna (Dyck) Harder, on 27 June 1908 in Halbstadt. They had four children: Johannes, Elsa, Alexander, and Henry David. Dietrich died on 20 August 1947 in Clearbrook, British Columbia, where he was buried. Dietrich was educated at the Zentralschule and Normal School in Halbstadt, and acquired a teacher’s certificate for advanced elementary grades in 1907. He taught in the elementary school in Bahndorf 1907-1908 and in Nikolaidorf, 1908-1914, in the orphanage of A. A. Harder in Grossweide, 1914-1921, and the elementary school in Grossweide, 1921-1925. Dietrich and his family immigrated to Canada on 10 August 1925. 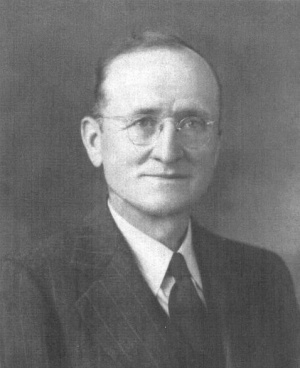 He tried farming in Saskatchewan before he became the first teacher and principal of Bethany Bible Institute in Hepburn, Saskatchewan (1927-1937). He moved to Elim Bible School, Gretna, Manitoba (1937-1939), the Mennonite Collegiate Institute (MCI) in Gretna (1939-1944), then Bethel Bible School in Clearbrook, BC (1945-1947). For some years, Dietrich served as a member of the Board of Reference and Council for the Canadian Mennonite Brethren Conference. Because he was not trained to teach in Canadian schools, Esau’s teaching was restricted to such subjects as German, ethics, Bible stories, catechism, church and Mennonite history. At the Mennonite Collegiate Institute, he was also the school’s music master and choir conductor. Gerhard Ens notes that the courses he introduced were continued in some form long after he left MCI. After his move to British Columbia, Esau taught at Bethel Bible School (later called Mennonite Brethren Bible School/Institute) and was elected Assistant Minister at the Clearbrook Mennonite Brethren Church at the annual meetings in December 1944 and December 1945. However, in late spring 1947, Dietrich was removed from both the church and teaching positions and was disciplined by the church. There is no official record regarding the reason, although rumors persisted for several years. Years later, one of the men involved in Dietrich’s dismissal from the church expressed the desire to clear his conscience of his involvement with the false rumors that had led to Esau’s removal. On 20 August 1947, after working in his yard, Dietrich came into the house complaining of tiredness and not feeling well. He lay down on the couch and died of a coronary thrombosis, for which he was being treated at the time. Many former students at Bethany and the MCI still speak highly of D. P. Esau’s charismatic teaching and the enthusiasm with which he taught German and how to study the Bible, including visits that he paid to outlying areas on Saturdays to meet with Sunday school teachers there. One former student recalls Saturday sessions in Melita, Manitoba, where he inspired many students to respect the stories of the Bible, which he described as the heart of the biblical message bringing hope to the discouraged and forgiveness to those who felt they had committed wrongs. Author Margaret Epp, a former student at Hepburn, called him "a teacher among teachers." "To this day," she wrote, "I count it one of the happiest privileges of my life to have had Esau as my teacher for four years." British Columbia Bureau of Vital Statistics. "Dietrich Esau." Abbotsford, Sumas and Matsqui News (27 August 1947). Warkentin, A. and Melvin Gingerich, eds. "D. P. Esau." In Who’s Who Among the Mennonites. North Newton, KS: Bethel College Press, 1943. "D. P. Esau." Mennonitische Rundschau (10 September 1947): 1. Ens, Gerhard J. "Die Schule Muss Sein" A History of the Mennonite Collegiate Institute, Gretna: Mennonite Collegiate Institute, 1990: 130-132. Epp, Margaret. Proclaim Jubilee (50th anniversary of Bethany Bible School). Hepburn, SK: Bethany Bible School, 1977. GRANDMA (The Genealogical Registry and Database of Mennonite Ancestry) Database, 6.06 ed. Fresno, CA: California Mennonite Historical Society, 2011: #405435. "Mrs. K. Esau." Abbotsford, Sumas and Matsqui News (12 September 1962). "Wwe. Kath. Esau." Mennonitische Rundschau (10 October 1962). Personal interviews with former students. Klassen, William. "Esau, Dietrich P. (1888-1947)." Global Anabaptist Mennonite Encyclopedia Online. April 2011. Web. 25 Apr 2019. http://gameo.org/index.php?title=Esau,_Dietrich_P._(1888-1947)&oldid=143070. Klassen, William. (April 2011). Esau, Dietrich P. (1888-1947). Global Anabaptist Mennonite Encyclopedia Online. Retrieved 25 April 2019, from http://gameo.org/index.php?title=Esau,_Dietrich_P._(1888-1947)&oldid=143070.